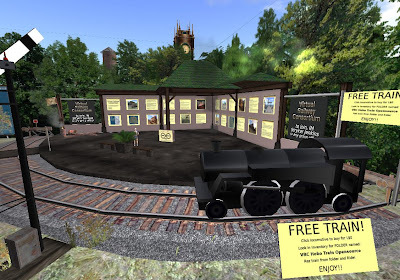 The Virtual Railway Consortium has opened up a welcome station at Crumbi. The station offers free trains and information on railways in Second Life. 2013 HELP: Thanks, Torley. Windows 7 does run Second Life. Is the Second Life Viewer compatible with Windows 7? Does Second Life run on Windows 7? Can I use Second Life on Windows 7? "I see that my system has two program directories, one called Program Files (x86) and the other called just Program Files. My Second Life run files are in the (x86) directory, as are most of the other legacy programs I have installed. My guess is that this directory is for programs that need to run in a 32 bit mode and that Win 7 usually detects that condition and installs in the correct directory"
You have heard about Oedipus Rex. Now you can watch it on the virtual stage. "Struggle with us. “Oedipus Rex” was presented on October 2, 3, 9,10, 16 and 17 at the new home of the Avatar Repertory Theater in Second Life. The acting company includes Joff Fassnacht, MadameThespian Underhill, Thundergas Menges, Em Jannings, Rowan Shamroy and Kayden Oconnell." A poem about believing. I call it Existentialism 101. Written and voiced by Selby Evans (Thinkerer Melville). Art work by Antonio Alza A. (elros Tuominen in Second Life). Believe. Believe? They told me to believe.They told me what to believe. "We are the Truth" they said. -But then... I saw. I see. I see not what they told me to see. I saw that they are like me. They can see Truth no more than I can. I do not know the Truth. I do not know the Way. I do not have the Light. Nor do they. They are blind men preaching to blind men. They are men who do not know preaching to men who do not know. I am one who does not know. This I know. I am naked in not knowing. This I know. I have watched my floor vanish before my opened eyes. The empty chasm of why has opened below me. I have felt the chill wind of not knowing. They had told me what I should do. They had told me who I should be… and why. They had given me the safety of belief. They had given me the floor to stand on. They had given me the answers to hide the empty chasm of not knowing. They had given me the answers to cover my nakedness of not knowing. As, they believe, the answers cover their not knowing. Now I understand the comfort of belief. Now I understand the chill wind of not knowing. I do not know who I should be. I do not know why I should be. I do not know, even, who gives out the shoulds. beyond the shoulds they make up. I do know the chill wind of not knowing. over the chasm of not knowing. And yet I must choose. That I do know. I must be the One Who Chooses. That I do know ... and now I know who I am. Nobody else can go there for me. I must go there for myself. I am the One Who Does. I am the sleeper who has awakened. I am the chooser of my fate. I must do that for myself. And I am one who can do that for myself. I cannot know, but I can choose. I do not know, but I will choose. I do not have the truth, but I do have the choice. I do not have the light, but I do have the choice. The one truth that I do know is that I must choose. But I speak not only for myself. Some of those who hear me are also Choosers. Or will be. They will know the chasm. They will know chill wind. the power of judging their own acts. And what of the others? They who already know what to believe? Quiet. They are asleep. Do not awaken them. They, too, have chosen. It is finished. We, the choosers, have not finished. We must be about Reality's work. If we choose. If we choose.